Its Flickr page does not have any other size except for what they call a “large” size at 129 x 85. Gosh! Why even bother sharing these photos in social networking media if all you have are pinhead size versions? Whose bright idea is this? I must note that the big guy in the White House has his own photostream in Flickr. The photos are all good quality in various sizes for download. They are all marked “United States Government Work” and except for the following notation, are available to the public under Creative Commons. Secretary Clinton also has her own photostream in Flickr. All sizes are available for download under the Attribution-No Derivative Works 2.0 Generic Creative Commons license. The Guardian’s Jon Boone in Kabul reported yesterday that the mayor of Kabul is pushing for diplomatic missions in the city to move into a high-security green zone. His report says that the diplomatic quarter would be built next to Kabul airport, allowing embassies to sit side by side, rather than having the buildings, seen as prime Taliban targets, scattered throughout the city. The computational knowledge engine, Wolfram|Alpha had its much anticipated rollout last Friday. They are apparently still testing it through the weekend but I got to play with it on Saturday and Sunday. Would it be too geeky to admit that I’m impressed with this brainy engine? This is not a search engine like Google. This is not an online encyclopedia like Wikipedia. They called this a “computational knowledge engine.” I think it’s the first of its kind. According to its website it generates output by conducting computations from its own internal knowledge base, instead of searching the web and returning links. And although it includes sidebar links to Wikipedia, it does not provide any narrative, but rather computes answers to specific questions ask. Its FAQ says that one should be able to ask it about essentially any kind of systematic factual knowledge. You get that response before you can snap your fingers. It also allows you to download the answer in a pdf format (although without the inclusion of the source info). In 1915, US diplomats were paid something like $3,000 a year. So I wanted to compute the current value of that historical quantity of money and entered this query “$3000 1915 dollars in 2009.” Accounting for a 3.33% average rate of inflation, that’s $ 65,205.34 (2009 US dollars) according to Wolfram|Alpha. You want to check out the odds for winning the Powerball? Wolfram|Alpha calculates your probability of winning as 1 in 195249054. You can see more Sports and Games here. Tee-hee! It’s not a search engine, you can’t Wolfram yourself. You are able to get information about books, compare books, get info on movies, songs, awards, and if you’re planning on writing a book, Wolfram|Alpha can calculate how many pages a 70,000 word work translates into (140 pages, single space). My one would be-favorite function is its ability to complete an aphorism (why? just because); well, when they can get it to work properly, or when I get better with my queries. I have searched for several aphorisms but was told, Wolfram|Alpha isn’t sure what to do with your input. They’re still working on kinks here and there but it can answer some whys, hows, dates and times …. heaven sent for anyone with inquisitive six year olds. Now, you can also get information on current and past political leaders, get historical dates including constructing a timeline of events. 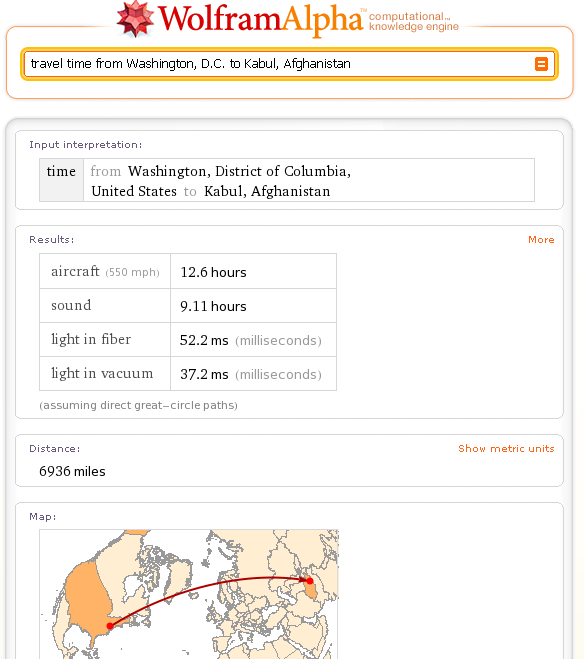 Wolfram|Alpha, however, cannot as yet decide what to do with “WMD, Iraq war” query but says it could be a future topic. You can look up organizations like the EU, ASEAN, G-8 but the query “G-20” returns a mathematical object. And for some reason, using “USAID” as an input term returns a completely bizarre response of “Ulaid” and this: “end date | 1177 AD current countries | Ireland | Ulster.” That’s when I had to go and check what that is, in where else — Wikipedia. 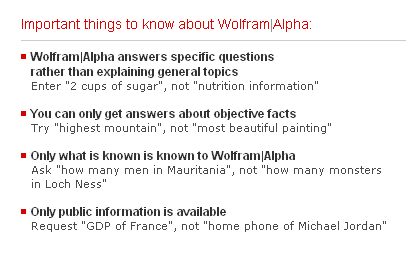 The knowledge Wolfram|Alpha puts out there is truly impressive – mathematics, geography, chemistry, engineering, etc. etc. I must admit that for one with AMDD (advanced mathematics deficit disorder), I can’t help but be amazed at what it can do. And if you’re ever lost, you can input “where am I?” and it will give you your current geoIP location. Aside from the calculations that it spits out, I have a few things that I particularly like about it: 1) the minimalist design of input bar; simple, uncluttered and nice warm color combination of red, orange, and yellow, 2) its red rhombic hexecontahedron logo is classy and easily identifiable and 3) its superfast computation, including converting “Diplopundit” into Morse code in a second! It reportedly has the ability to handle 175 million queries (yielding maybe a billion) per day—over 5 billion queries (encompassing around 30 billion calculations) per month. One reviewer says that “Wolfram Alpha makes tackling advanced formulas so easy – even walking you through step-by-step solutions – that I tremble for the intellectual future of university students.” He could be thinking what I’m thinking – students’ outsourcing their brains to a super computer online (Why learn calculus, when Wolfram|Alpha can do it for you?). Still, could this be the future of the net? Here is the screencast of its launch via Justin.tv. You can check out the website here. This project is the brainchild of Stephen Wolfram, see his Wikipedia entry here. I’ll keep playing with this for now. It does not always understand all the input queries I put in, but I’d like to think that if its a smart enough engine, it would be smart enough to learn the idiosyncratic queries people put in.